The Director of Health, Dr Constance Chan, today (April 7) said that three out of 100 adults in Hong Kong have depression and one out of 10 elderly persons have depressive symptoms, yet more than half of the people with depression have not sought help from mental health services. She reminded the public that depression can be prevented and treated, urging those who suspect they have depression to seek help as early as possible. 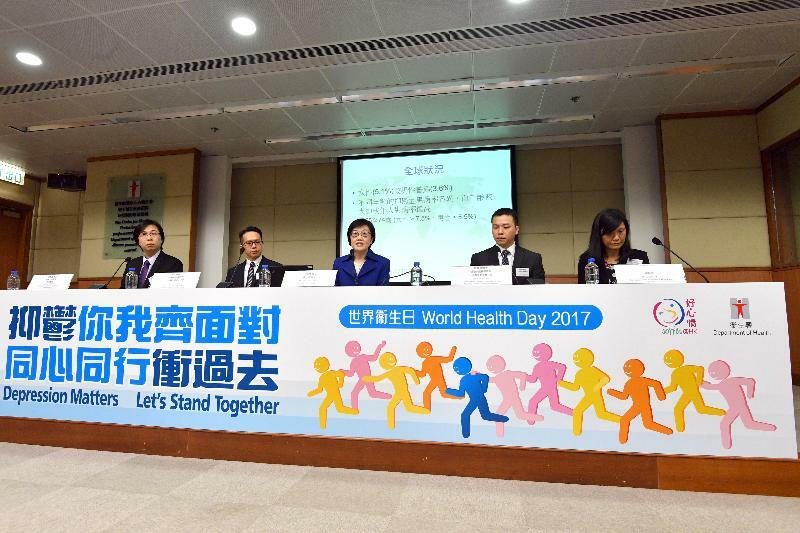 Dr Chan reviewed the situation of depression in Hong Kong at the press conference on World Health Day 2017. April 7 is designated as World Health Day. The World Health Organization (WHO) selects an important public health topic as a theme every year and this year's theme is "Depression". Depression affects people of all ages from all walks of life. According to the WHO, more than 300 million people are suffering from depression globally, equivalent to 4.4 per cent of the world's population. The number of people with depression increased by 18.4 per cent from 2005 to 2015. Depression is now the leading cause of disability worldwide and is a major contributor to the overall global burden of disease. It is estimated that depression and anxiety result in a global economic loss of US$1 trillion every year. As regards the situation in Hong Kong, according to a local study, the one-week prevalence of depressive episode for adults was 2.9 per cent and the risk increased with age, reaching 4.7 per cent in adults aged 66 to 75. The healthcare burden of depression in Hong Kong is on the rise as reflected by the increase in the number of patients with depression receiving specialist psychiatric services in the Hospital Authority from 48 900 in 2011-12 to 61 100 in 2015-16. Dr Chan said, "Depression has been found to be the major contributor to suicide deaths. According to a review of the Coroner's Court's suicide case files in Hong Kong from 2011 to 2015, among those cases with known information on whether there had been psychiatric illness or not, around 30 to 40 per cent had major depressive disorder. In 2015, about 30 per cent of suicide cases in Hong Kong were elderly persons aged 65 or above. A local study found that elderly people with depressive symptoms had 2.2 times the risk of suicide mortality of those without." 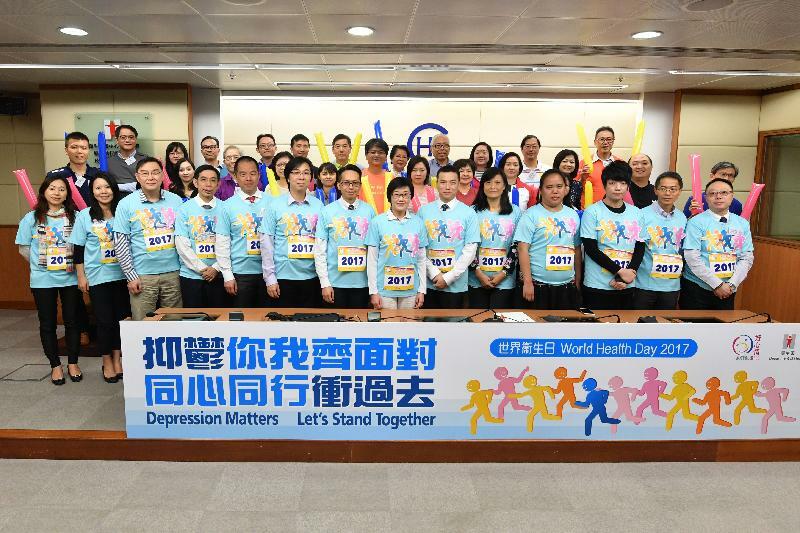 Dr Chan said that, to echo this year's World Health Day and its theme of "Depression", the Department of Health today launched a publicity and public education campaign with "Depression matters: Let's stand together" as the slogan. The Campaign will bring out two important messages and provide advice based on the three key elements - "Sharing", "Mind" and "Enjoyment" - advocated by the "Joyful@HK" Campaign. "The first message is 'Depression can be treated'. Talk with someone you trust about your feelings for the first step to recovery, seek professional help and do exercise regularly. Exercise has been proven to be effective in both the prevention and management of depression. The second message is 'When you live with someone with depression, you can help them recover'. While offering your support, you should also take good care of yourself," Dr Chan added. Representatives from four key partners of the Campaign, namely the Mental Health Association of Hong Kong, the Hong Kong College of Family Physicians, the Hong Kong Psychological Society and the Hong Kong College of Psychiatrists, also attended the press conference to further explain the nature and treatment of depression as well as the services available in the community for people with depression and their caregivers. The Director of the Mental Health Association of Hong Kong, Ms Kimmy Ho, pointed out that Integrated Community Centres for Mental Wellness have been established in the 18 districts throughout Hong Kong. These centres are staffed with a multi-disciplinary team of professionals to provide one-stop, district-based community support and social rehabilitation services for residents living in the serving district, including people with suspected mental health problems, people with depression and their families or carers free of charge. The Chairman of the Public Education Committee of the Hong Kong College of Family Physicians, Dr Allan Ngan, said that a person who is troubled with emotional problems should first seek help from his or her family doctor who is ready to co-ordinate medical needs and offer comprehensive and continuous care for patients with depression, as well as provide care and support to patients' family members. The President Elect of the Hong Kong Psychological Society, Dr Amos Cheung, explained that the warning signs of suicide related to depression include helplessness and hopelessness, worthlessness and meaningless, reckless behaviour, talking about killing or harming oneself, sudden switches from being extremely depressed to acting calm and happy, and suddenly becoming irritable or impulsive. He said depressive patients can seek psychotherapy from qualified mental health professionals. This can effectively assist patients to develop insights and effect change across levels of cognition, behaviour and emotion. The Chairman of the Public Awareness Committee of the Hong Kong College of Psychiatrists, Dr Ivan Mak, pointed out that depressive disorder, which is different from everyday blues or sadness, is not just a psychological problem but also has a physiological basis. A variety of factors can affect the balance of the neurotransmitter system of the brain, leading to disturbance to emotion, motivation and thinking. Most depressive patients can receive treatment in the community, while those with severe depressive episode, strong suicidal intent and serious self-neglect problems may need hospitalisation. There are also newer drugs with fewer side effects and better tolerance. However, these drugs would not have an immediate effect and patients must follow the instructions of doctors. In addition, two patients who have recovered from depression were invited to talk about their experience and road to recovery in the press conference. The ambassador of the "Joyful@HK" Campaign, Sammi Cheng, urged the public to face depression with a positive attitude through an appeal video, to echo the theme of World Health Day 2017. More than 60 key partners and organisations also gave support to the Campaign to jointly enhance the public's understanding of depression. Please visit the World Health Day thematic webpage (www.chp.gov.hk/whd2017) for more information about depression. The Facebook fan page of "Joyful@HK" (fb.com/joyfulathk) will issue a series of posts with information about depression. Members of the public are welcome to "Like" and share the fan page.